Addressing Texas Tech quarterback Graham Harrell. The Red Raider was my pre-season pick for the Heisman Trophy and unfortunately he was the odd man out and failed to get the invite to New York this weekend. Harrell threw the ball more than any division 1 college football quarterback, he has arguably the most feared college football player catching balls for him, and unfortunately the last taste in voters mouth was his teams performance in Norman, Oklahoma. 10 games Harrell threw for more than 300 yards, including 5 over 400 yards, and 1 over 500 yards. His 41 touchdowns next to only 7 interceptions is mind blowing, yet still seven short of Heisman hopeful, Sam Bradford. Harrell threw for nearly 300 more yards than Bradford while averaging more than 13 attempts per game. Bradford is playing for a title, Tebow is playing for a title, and the 3rd candidate, Colt McCoy could argue playing for a title. Sorry Graham. 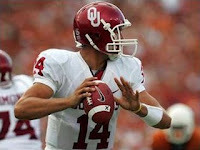 Oklahoma Sooner QB, Sam Bradford. He wouldn't get my vote. Certainly capable of being the Heisman Trophy winner, but again he wouldn't get my vote. He's got more yards passing (4,464) than Tim Tebow , less interceptions (6) than Colt McCoy, and still he doesn't get my vote. Sure, he has set the world on fire by tossing 48 touchdown passes. Of course he averages less attempts yet has more yards passing than fellow Big XII quarterbacks, Graham Harrell, Todd Reesing, and Chase Daniel. Wait, now I forgot why this Sooner isn't get my vote . . hmmmmm, oh that's right, because my SEC bias mind won't allow me to. Sam Bradford is a flat out stud, his numbers are off the charts and the kid has tore up the Big XII this season. Since their lost to Texas back in October, Bradford has throw 25 touchdown passes and only one interception in 7 games. In 9 of 12 games this season the Sooners offense led by the sophomore quarterback has scored 50 points or more, including the last five wins finishing the season going over 60 points in each game. However, in his heads up with Texas quarterback Colt McCoy, Bradfords five touchdowns become cloudy given that his two interceptions may have cost the Sooners an undefeated season. Bradford has two receivers with 9+ touchdowns and an All-American tight end in, Jermaine Gresham, who caught 12 touchdown passes on the season. In my mind, it's the wins that set you apart, and no amount of touchdown passes against Texas matter when the final score is 45-35 and your on the losing end. Florida Gator QB, Tim Tebow You may have seen that impassioned speech from Tebow, back after the Gators suffered their first and only loss of the season and think wow this guy is pissed off about that loss. What do I see? I saw the reigning Heisman Trophy winner and former National Champion decide that not only was he not bigger than the team, but that he wanted nothing more than to win another National Championship. Tebow has lead the countries best team to a impressive 12-1 record and an SEC Championship this season. His passing numbers aren't the god like numbers of McCoy, Harrell, and Bradford, but they are not something to sneeze at. Tebow passed for over 2,500 yards to go along with his 28 touchdown passes and just 2 interceptions. He's most likely the only quarterback in the country who would be on a draw 9 times out of 10 on 4th and goal. On the ground Tebow rushed for over 500 yards for the second straight season and banged out 12 rushing touchdowns on the way. Against in-state rival Florida State, Tebow threw three touchdown passes and ran in a fourth en route to a 45-15 thumping of the Seminoles. Against South Carolina, Tim Tebow announced to the world who the new King of the Swamp was. In front of former Gator turned Gamecock head coach, Steve Spurrier, Tim Tebow completed 65% of his passes, threw for two touchdowns and rushed in for another. In between the hedges at Athens, Georgia, Tebow scored 5 times, twice through the air, and three times on the ground. Final score, Gators 49 Bulldogs 10. His most masterful performance was saved for the SEC title game, against previously undefeated Alabama, Tim Tebow turned out a second half for the ages. At the end of the third quarter, Tebow engineered an 11 play 62 yard drive that ate up the final six minutes of the quarter and led to a go ahead touchdown. Mid-way through the fourth, Tebow came onto the field and led the Gators on an 8-play 65 yard drive, eating up four minutes and thirty-seven seconds which would put the nail in the coffin of the Crimson Tide. If your starting, scratch that, if I'm starting a college program, I want Tebow under center and the '07 Heisman under his left arm. Texas Longhorn QB, Colt McCoy With Mac Brown as the head coach, I never thought their could be another player or coach whose name best suited the school they played for. 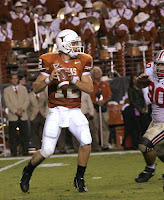 That was until Colt McCoy set Longhorn Nation into a frenzy. This quarterback can flat out play. If your a big time, big school, big program quarterback there is one stat that separates you from everybody else: Completion Percentage. Anyone can throw the ball 50 times a game, put a few in the end zone, rack up yards, and dominate soft defenses, but completion percentage measures how good of a passer you really are. So when it comes to completion percentage, no one is better than Longhorn quarterback, Colt McCoy. McCoy's 77.6 completion percentage is a nations best. Colt's 28 of 35 passing with zero interceptions against Oklahoma, yes, that would be an 80% completion percentage, was more important than anything in the Longhorns 45-35 victory. Not only does McCoy put up mind blowing passing numbers (32 TD's, 3445 yards passing, and 7 games with an 80% completion percentage or higher), but he, like Florida quarterback Tim Tebow, has rushed for over 500 yards on the season and ten rushing touchdowns. For an entire season leading up to the Texas Tech game, Colt McCoy was the runaway Heisman winner, a stumble on the road in Lubbock kept both the Longhorns from winning a National Title and in my mind it will keep Colt McCoy from finishing any higher than third. My Pick: Tim Tebow, Florida. if anyone is qualified to join the likes of Archie Griffin, it is Tebow. When he beats Bradford in the National Title game, you'll see why. Who Will Win: Sam Bradford, Oklahoma. When playing trivial pursuit and the question is; Name the only college football player to take home the Heisman Trophy twice, you'll say Archie Griffin. You'll be right. Voters aren't willing to crown Tebow twice, and his 2008 doesn't compare to his 2007. Bradfords numbers are what will make him the Heisman Trophy Winner.